84. Flash’s soft white baps! 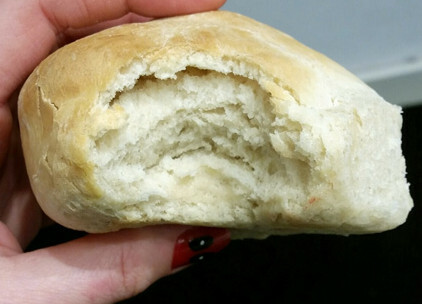 If you want to cause an argument in the UK, ask a group of people what they would call this particular bread product. 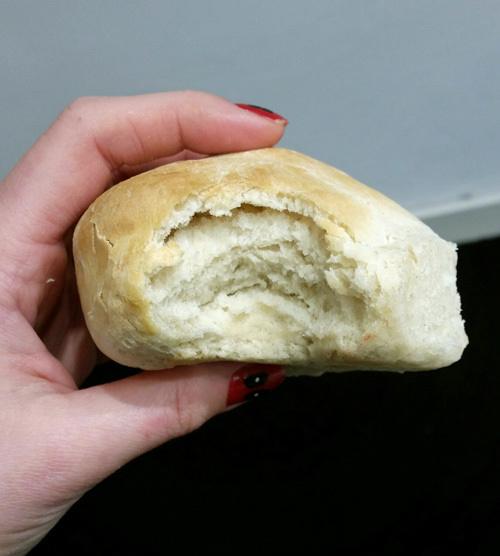 Is it a roll, bun, cob, stottie, batch or a barm? In this case I’ve chosen to call it a bap, purely for the innuendo. This is such a great easy recipe, the hardest part if having the time to let the dough prove. 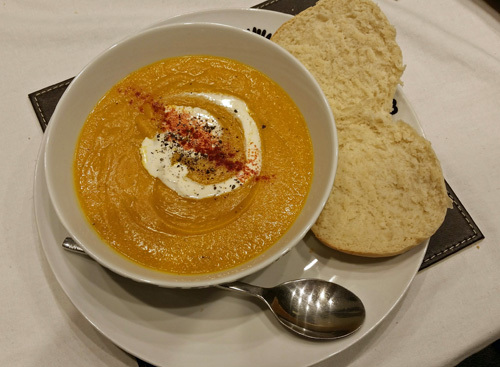 But its well worth making space in your busy schedule for these as they are delicious and don’t contain any of the nasty preservatives found in shop bought bread. In a jug, mix the water, soya milk, salt and sugar. Sprinkle the yeast on top and put in a warm place for 10 minutes or until the yeast blooms. In a large mixing bowl, add the bread flour and plain flour and mix to combine. Create a well in the centre. Gently stir the olive oil into the yeast mixture before pouring into the well of the flour. Using a wooden spoon, mix until all the liquid is absorbed. Using your hand, knead the mixture until a dough is formed. Transfer onto a clean work surface and knead for 5 minutes. You shouldn’t need to add any extra flour. Roll the dough into a ball and put back into the mixing bowl. Cover with cling-film and leave in a warm place for at least 1 hour or until the dough has doubled in size. Deflate the dough and knead for another 5 minutes. Roll into a log shape and divide into 8 equal pieces. Knead and shape each piece into a ball before flattening into a disc of about 1inch high. Grease a baking tray and lay out the baps on top. Don’t place too close together as they are going to roughly double again in size. Glaze the top of each bap with a little oil and a sprinkle of salt. Move to a warm place for at least 30 minutes or until the baps have doubled in size. Place into the oven and bake for 15 – 20 minutes. They should only just be turning a light golden brown but will sound hollow when tapped on the bottom. Whilst the buns are baking, line a plate or a tray with some kitchen roll. When ready, remove the baps from the oven and immediately place on the kitchen roll before wrapping in Cling-Film. 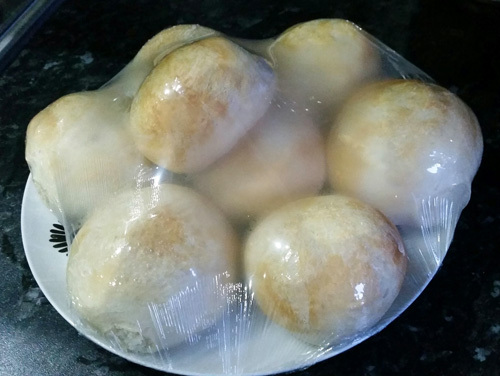 It is normal for the Cling-Film to steam up – this will make sure that the baps are soft whilst the kitchen roll will prevent them from becoming soggy. 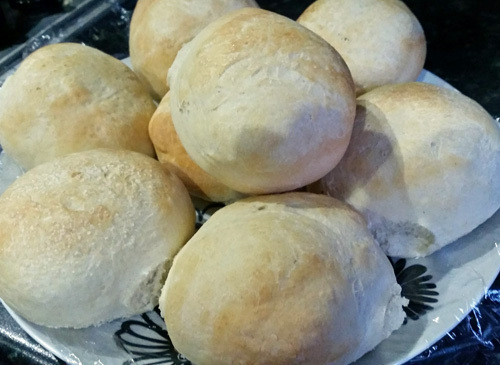 The Cling-Film ensures that the baps stay soft once cooled. Allow to cool and then eat! They are especially good served with soup. Best used up within 1 -2 days of baking.